We believe in creating unique food, wine, and beer experiences for our travelers. To help us do just that, we focus on running small group public tours, with anywhere from 4 – 16 people on a trip. “Fantastic – fun – informative – couldn’t have asked for a better vacation!” Sandy T.
You don’t have to get your own group together. Everyone loves to go on vacation, but trying to organize a group of your friends or family is one of the hardest parts of planning a trip. People’s schedules, budgets, and preferences are all different. Not everyone is going to want to go to the same destinations and do the same things as you do. Meet other like-minded people. 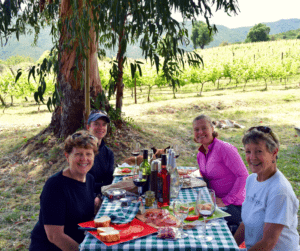 On a small group public tour, you have the opportunity to meet others who have the same interests in common – travel, culture, food, wine, and beer! You may just meet your next traveling buddy. Everything is taken care of for you. From the moment you meet our guides to when you are saying your farewells heading for your flight home, we organize the transportation, accommodations, meals, tastings, and activities. We have chosen what we consider to be the best tour destinations in the world, and in those locations, the best itineraries and activities. You merely need to show up, enjoy, and relax. Isn’t that what vacation is for? Though we do the same on our private tours, you would be more involved in choosing different itinerary options, which can cause stress for some people. Small group tours provide intimate experiences. We strongly believe in keeping our tours as small and intimate as possible. This allows us to stay in boutique accommodations, dine at local, intimate restaurants, and share in remarkable experiences that would not be the same if we had a large group. You won’t like it, you’ll love it. We’ve heard it time and time again from our new travelers – “I don’t think I’m going to like going on a public tour.” But once they go, they love it! They enjoy the pleasant, personal environment that small public group tours create.